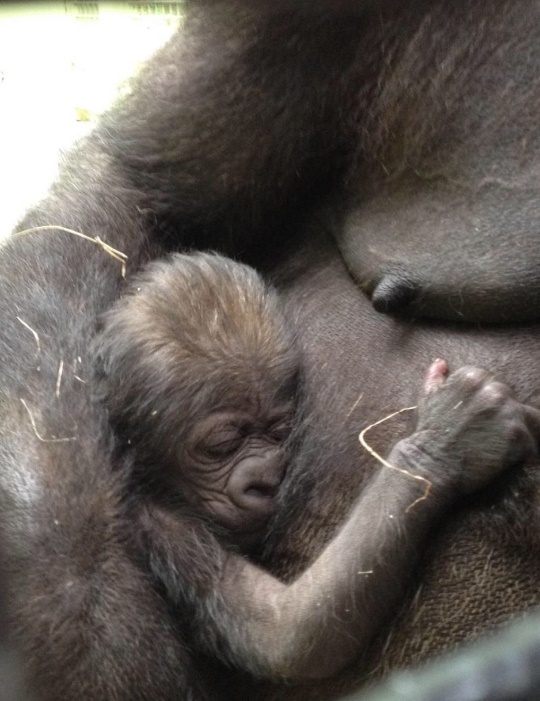 KNOXVILLE, Tenn.— Knoxville Zoo is excited to announce the birth of an endangered Western lowland gorilla baby early Thursday morning. The baby was born at approximately 2:30 a.m. on Thursday, May 28, 2015, to 31-year-old mother Hope, who came to Knoxville in 2012 from Disney’s Animal Kingdom in Orlando, Florida, on the recommendation of the Western Lowland Gorilla Species Survival Plan. Both mother and baby appear to be doing very well, and Knoxville Zoo staff are continuously monitoring them and the zoo’s gorilla group, which includes females Kowali and Machi and first-time father Bantu. As long as the baby and Hope continue to do well and there are no concerns about their interaction with the other members of the family group, zoo staff will not intervene and let Hope do what comes naturally to a gorilla mother. This is the first gorilla ever born in Knoxville and the first gorilla born in the state of Tennessee in 30 years. This is Hope’s fourth baby, who has a history as a patient, attentive and playful mother. Knoxville Zoo also has another pregnant female, Machi, who is expected to give birth in the next few weeks. Knoxville Zoo’s gorilla habitat, Gorilla Valley, will be closed to public viewing for the immediate future to give mother and baby time to bond. Zoo staff will open the area as soon as Hope seems receptive to having visitors within the next few days. Western lowland gorillas are native to the rainforests of equatorial Africa. While the decline in their numbers can be attributed to habitat loss, commercial hunting and outbreaks of the Ebola virus have been having significant impact on the population since the early 1980’s. Western lowland gorillas are classified as a Critically Endangered species by the ICUN Redlist of Endangered Species, which is widely recognized as the most comprehensive, objective global approach for evaluating the conservation status of plant and animal species. Knoxville Zoo works with other zoos accredited by the Association of Zoos and Aquariums (AZA) as part of the conservation efforts of the Western Lowland Gorilla Species Survival Plan (SSP), which manages the breeding and social placement of all gorillas in the U.S.
Knoxville Zoo is Knoxville’s largest year-round attraction. Located off exit 392 from Interstate 40, the zoo is open every day except Christmas Eve and Christmas Day. Knoxville Zoo is nationally accredited by the Association of Zoos and Aquariums (AZA) and is committed to the highest standards in animal care and well-being, ethics, conservation, and education. Currently, the zoo is open daily from 9:30 a.m. until 6:00 p.m. Admission and ticket sales stop one-hour before the zoo closes. Next-day admission is free after 3 p.m. For more information, please call 865.637.5331 ext. 300 or visit knoxvillezoo.org.